The Key to a Successful Music Career. Learn how to use the power of Marketing to build the music career you've always dreamed about. According to the Music Industry Research Association, the average musician in America earns just $25,000 per year from their music. This means the vast majority of musicians are doing it all wrong. What separates these musicians from artists like Chance The Rapper? The answer is Marketing. ​If you can find your audience, you can create the music career yo’ve always dreamed of. 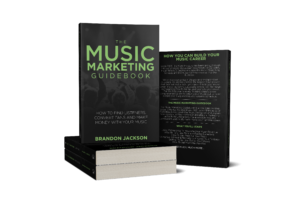 The Music Marketing Guidebook will show you how to find your true fans and turn them into high paying customers that will allow you the financial freedom you need to be successful in your music career. Learn how to find people who are most likely to enjoy and engage with your music. Turn casual listeners into avid fans, who are willing to support you with their dollars. Finally learn how to monetize your art so that you can make Music your full time career! We break down the basics of marketing and how it relates to your music career. We teach you about funnels, and the key to turning casual listeners into rabid, die-hard fans. We teach you how to build your website, optimize your social media presence, and even use paid advertising to attract new listeners and lead them down the fan conversion journey. Here, we talk about networking, team building, touring, press and more. These real world strategies combined with your online efforts are what will launch your career into the stratosphere! Bringing it all together. We'll walk you through your integrated marketing campaign and show you how to plan your music release step by step. I used your email template and got a writer to pick up to do a story for my next project in a few months for HipHopDX. The gems work. Keep providing. Thank you so much for all of the sound advice towards the music industry. I feel more confident having you guys in my corner. When you order, we'll send you a copy of the e-book in .pdf and .epub formats for easy viewing on any device. You'll also get an exclusive invite to the Indie Club, our private community of artists and music industry professionals on Facebook. All for the low price of $19.99! The key to building your fan base and achieving the career success you've always wanted is just a few clicks away. Still not convinced it's right for you? Download a Free Sample Chapter Here. Looking for even more support? Soon, we'll be launching Gold and Platinum Editions of The Music Marketing Guidebook complete with an audio version and a video course that teaches you how to set up your ad campaigns step by step. Your purchase of the standard edition automatically puts you on the waiting list for the new editions, and saves you 25% off the upgrade price.